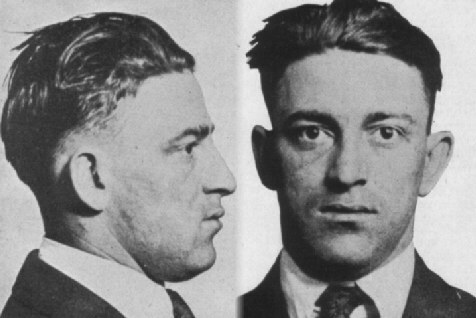 There are those who have said that little Hymie Weiss—rather than the jolly Irish psychopath Dion O'Banion—was the toughest foe Al Capone ever faced in his battle to take over Chicago crime. The Polish-American Weiss, O'Banion's successor as leader of the intractable Irish North Side gang, stood up to the encroachments of the Johnny Torrio–Al Capone combination for several bloodstained years. Hymie Weiss was a most devout cold-blooded murderer who hardly ever missed Mass. He would never dream of venturing forth without crucifix and rosary in his pocket. And he always carried a gun or two. With the latter, a cynical newsman observed, he "could perform his own version of the last rites on an enemy." Crime experts credited Hymie Weiss with being the one responsible for building O'Banion's bootlegging empire. He was more thoughtful, forward-looking and resourceful than the often explosive O'Banion and relied far more on reason and bribery than "Deanie" ever did. He also left his mark in the criminal dictionary, having originated and christened the "one-way ride." In 1921, a gangster named Steve Wisniewski offended the O'Banions by hijacking one of their loaded beer trucks. O'Banion assigned Weiss to exact the proper vengeance. He invited Wisniewski for a drive along Lake Michigan, from which the hijacker never returned. As Hymie Weiss quaintly stated to friends, "We took Stevie for a ride, a one-way ride." Hymie Weiss was born Earl Wajciechowski, which the family changed to Weiss shortly after they arrived in the United States from Poland. Befriending O'Banion in his teens, he became an accomplished burglar, car thief, safecracker and hired slugger in the newspaper wars and for labor unions. O'Banion's passion in that period for jewel theft and other safecrackings was swelled by Hymie, whom O'Banion called the "best soup artist in Chicago." With Prohibition, the boys moved into bootlegging, and Weiss, as O'Banion's right-hand man, showed saloon keepers the superiority of O'Banion's merchandise, explaining that there was not a bit of lead in the booze barrels, but there would be if they bought elsewhere. Hymie Weiss wept openly and honestly at O'Banion's grave after the latter was murdered in November 1924. There was no doubt at all that Torrio and Capone had engineered Deanie's murder, even though Capone boldly showed up at the services, albeit with six bodyguards. Weiss kept the O'Banion gunners in check at the cemetery, having promised the Irishman's grieving widow there would be no further violence until after their beloved Deanie was planted. The Chicago police had 100 officers at the gravesite to ensure peace. Asked by a reporter if he held Capone responsible for O'Banion's assassination, Weiss threw up his hands in mock horror for the merest suggestion of that. "Blame Capone? Why Al's a real pal. He was Dion's best friend, too." Then Hymie Weiss went back to plotting revenge. For two months, Hymie Weiss maintained a cover of peace. (He even banished Two Gun Alterie from the gang because he kept publicly stating the gang was going to get Capone.) Finally on January 12, 1925, Weiss, Schemer Drucci and Bugs Moran tailed Capone's black limousine to a restaurant at State and 55th Streets. They drove slowly by and pumped 26 slugs into the vehicle. The chauffeur was wounded but two bodyguards in the back seat were unhurt. Capone, who had stepped into the restaurant seconds earlier, was unscathed. Then Hymie Weiss tried to get Johnny Torrio as he was riding in his limousine. The chauffeur and Torrio's dog were killed, but Torrio escaped with just two bullet holes in his gray fedora. Torrio and Capone raced to knock off Hymie Weiss before he could strike again, but Weiss stayed out of sight. Then on January 24, 1925, Torrio was ambushed in front of his apartment house as he and his wife, Anna, returned from a Loop shopping trip. As Mrs. Torrio entered the apartment house lobby, Torrio followed with an armload of packages. Weiss and Bugs Moran jumped out of a passing blue Cadillac. Weiss downed Torrio with a sawed-off shotgun. Then Moran, wielding an army .45 automatic pistol, squeezed off two shots. Poised to apply the coup de grace—a shot pointblank through the head—Moran and Hymie Weiss instead fled at the sound of an approaching vehicle (which turned out to be a laundry truck). Torrio hovered near death in the hospital for more than two weeks. When he was discharged, he retired from Chicago crime and turned the whole operation over to Capone. Weiss's attempts to rub out Capone continued. Perhaps the most famous occurred in Cicero on September 20, 1926, when a fleet of automobiles filled with his gangsters drove past the Hawthorne Inn and ventilated the building with 1,000 bullets and slugs from shotguns, handguns and machine guns. A Capone bodyguard and a woman bystander were shot, but again Capone was not hit. Three weeks later, on October 11, 1926, Hymie Weiss bought it himself. Capone assassins machinegunned him to death as he crossed the street to his headquarters above O'Banion's old flower shop. A bodyguard, Paddy Murphy, was killed in the same blaze of bullets, and three others with them were wounded. The shooting came from a second-floor room across the street, a room rented the day following the Cicero raid. Weiss, aged 28, left an estate believed to be worth well in excess of $1.3 million. His widow seems to have been most upset by the fact that there were only 18 carloads of flowers for Hymie's funeral while earlier funerals for O'Banion and Nails Morton of the North Siders had rated 26 and 20 loads each. Bugs Moran patiently explained to the widow that since the murder of O'Banion, 30 other members of the gang had fallen, mostly to Capone guns. This had considerably reduced the number of available flower donors.